Dodge and SRT are again working together to create an amazing driving experience, this time with the new 2018 Dodge Durango SRT. Dodge is calling it the Dodge Charger of the full-size segment, and that description could not be more appropriate. It merges the power and acceleration of the classic American Charger with the capability and spaciousness of the three-row Durango SUV. The SUV, which will be available in the Fall of 2017, will offer best-in-class towing capabilities and more! The amazing new 2018 Dodge Durango SRT is certain to be the most powerful three-row SUV available on the market. It will provide 475 horsepower at 6,000 rpm and 470 lb.-ft. of torque at 4,300 rpm, due to the legendary 392-cubic-inch HEMI V-8 engine. The incredible powertrain also features a performance-tuned all-wheel drive system, which enables the Durango to offer a best-in-class towing rating of 8,600 pounds. The engine is linked to a standard TorqueFlite eight-speed automatic transmission, which has been calibrated specifically for the Durango SRT. The Durango SRT has been certified by the National Hot Rod Association (NHRA) to deliver 0-60 mile per hour acceleration in 4.4 seconds. It also has an NHRA-certified quarter mile time of just 12.9 seconds. To ensure that drivers are getting the most out of their incredibly dynamic and performance-oriented models, Dodge will provide all new Durango SRT customers with a one-day full session at the acclaimed Bob Bondurant School of High Performance Driving. But Dodge will also make it intuitive and engaging to drive the vehicle due to the seven SRT drive modes, which can be engaged to quickly alter the vehicle's performance for the following environments: Auto, Track, Sport, Snow, Tow, ECO, and Valet. 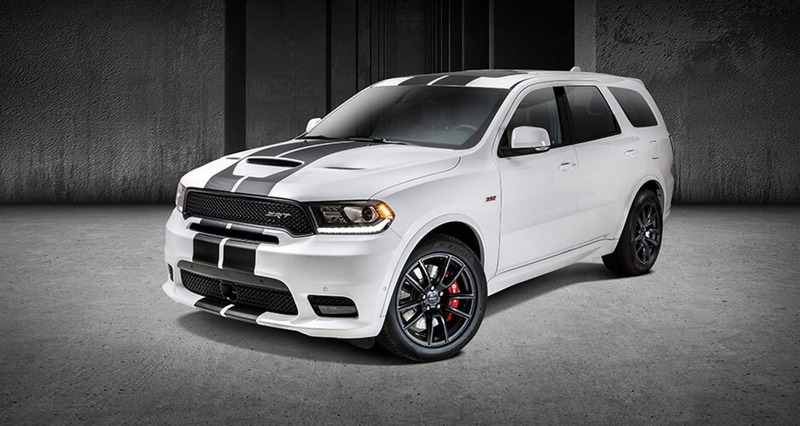 The design of the Durango SRT has been constructed in a way that maximizes performance while also enhancing style. It will have a variety of new performance features, including a new front fascia and lower valence that will house a new cold-air duct. Other features will include a wide body design and a functional SRT hood that is flanked by heat extractors and has a center air inlet. There are eleven dazzling exterior colors that can be chosen, and a variety of exclusive SRT badges found throughout the exterior and interior of the vehicle. The interior is beautifully furnished with high-end materials, including Demonic Red Laguna leather upholstery, and a new carbon-fiber trim. The driver will have an SRT flat-bottom performance steering wheel with SRT paddle shifters, along with ventilated and heated seating for both the first row and second-row captain's chairs. There are over 60 available and standard safety and security features offered by Dodge. Some of the options include the most innovative driver assistance features on the market, including Blind-Spot Monitoring Protection and Rear Cross Path Detection. There is also a Uconnect Access feature which will provide quick access to emergency assistance features. Standard features will include trailer-sway control, all-speed traction control, and seven standard airbags. There is so much to say about the new 2018 Dodge Durango SRT, and we can't wait to tell you more! If you have any questions about this model or any of the other models in the Dodge or SRT lineup, drivers near Long Island, NY can get in touch with us today at East Hills Chrysler Jeep Dodge Ram!